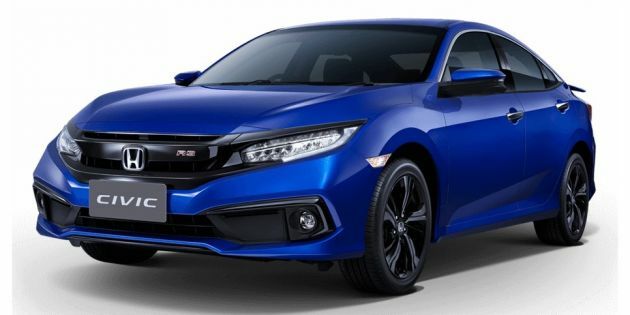 The Honda Civic facelift has been officially launched in Thailand, a few months after the refreshed FC-generation model first made its global debut in the United States. Aside from aesthetic improvements, the facelift also sees some changes to the equipment list across the model line-up. In Thailand, the Civic sedan is offered in four variants – 1.8 E, 1.8 EL, 1.5 Turbo and 1.5 Turbo RS – with prices ranging from 874,000 baht to 1,219,000 baht. A CVT is the only transmission option here, and it is paired to one of two petrol engines. The first is a 1.8 litre naturally-aspirated four-cylinder i-VTEC petrol engine that makes 141 hp at 6,500 rpm and 174 Nm of torque at 4,300 rpm, while the other is a 1.5 litre VTEC Turbo four-pot with 173 hp at 5,500 rpm and 220 Nm from 1,700-5,500 rpm. Exterior updates include a new front bumper where the lower apron now sports a one-piece look instead of three. Depending on the variant, the “wing” on the grille as well as the garnish near the fog lamps are finished in either chrome or piano black. Around back, there’s a new chrome trim piece on the lower rear bumper, while along the sides, new wheel designs have been introduced. Variants with the VTEC Turbo mill get 17-inch alloy wheels, and the rest come with 16-inch units instead. The interior is unchanged in terms of look and layout from before. In term of equipment revisions, the most significant is the addition of the Honda Sensing suite of safety and driver assist systems (only available for the 1.5 Turbo RS). These include the Collision Mitigation Braking System, Adaptive Cruise Control with Low-Speed Follow, Lane Keep Assist System, Road Departure Mitigation System with Lane Departure Warning and Auto High Beam. All variants get Vehicle Stability Assist (VSA), ABS, EBD, Emergency Stop Signal (ESS), a rearview camera and four airbags by default. However, only the 1.8 EL and 1.5 Turbo RS get two additional airbags and Honda LaneWatch camera system that supplements side mirrors. A seven-inch touchscreen infotainment system is found on all variants, save for the entry-level 1.8 E that gets a five-inch unit only. The top-spec 1.5 Turbo RS’ system benefits from navigation functionality and eight speakers, with the latter being fitted on the 1.5 Turbo and 1.8 EL variants as well (six speakers for the 1.8 E). As for other equipment available there is keyless entry and start, automatic air-conditioning, eight-way powered driver’s seat (except the 1.8 E), four-way powered passenger seat (Turbo and Turbo RS only), leather upholstery (except the 1.8 E), LED daytime running lights, LED taillights and projector headlamps (Turbo RS gets LEDs). The Turbo RS gets dedicated badging on the front grille along with a sporty rear wing. Customers will get to choose from five exterior colours – Brilliant Sporty Blue Metallic, Platinum White Pearl, Lunar Silver Metallic, Modern Steel Metallic and Crystal Black Pearl – with the first two being new additions. The cabin comes in two colours – beige and black – depending on the exterior colour selected. Civic hatchback 1.5 turbo please! Wow, everything also, all car companies launch in Thailand. Cause they view Thailand as a progressive and condusive market. I wonder why they never launch new facelifts in Malaysia anymore. Your ageing back & knees will be aching every time you get out of this low centre of gravity car. I nearly bought this car but have to consider my 75 year old parents, who won’t be comfortable going in & out of this Civic. Habis lah basher john, today sure MC. Tak ada modal lagi nak bash Jepunis overlord cars. You mean jepunis brands with many ‘gates’? Is paultan.org not covering the Bangkok motor show this year? This is Thailand International Motor Expo. Should not call it facelift..Updates only. In thailand, toyota is the king. In Malaysia, its honda. Despite that, thai honda models are always better than malaysia. What a shame. Better stick to proton. Not much being change. Very minor FL. The one-piece look front bumper makes the front seems more flat and the garnish near the fog lamps is not attractive. Still prefer the current front bumper, looks perfect even without changes. Additional chrome trim on the lower rear bumper is good. Doesn’t look any better than the current design! Why need the facelift then? 1.8 sure tak laku. No subsidy. Same to 1.6l campro Proton model. Sure tak laku. Lim guan eng kills Proton silently..
Buy civic 1.5turbo better than suprima s 1.6turbo. Get petrol subsidy below 1.5liter engine. this car is made to compete with BMW 3 series and Audi A4. Any rumors for 2019 Civic FC Facelift for malaysian market? may I know when will coming in Malaysia? alreday booking long time in malaysia,when launching in malaysia ? 1.5L turbo is Auto or manual? 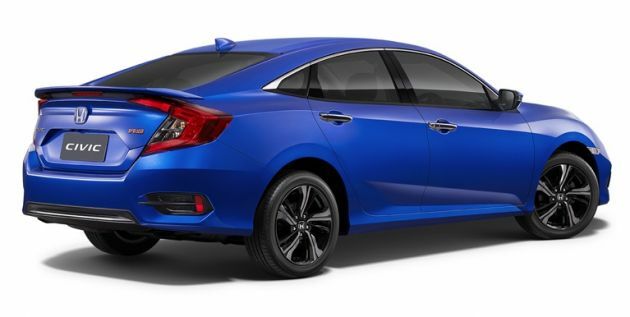 now already 3/4/2019 still don’t have any Honda civic news?